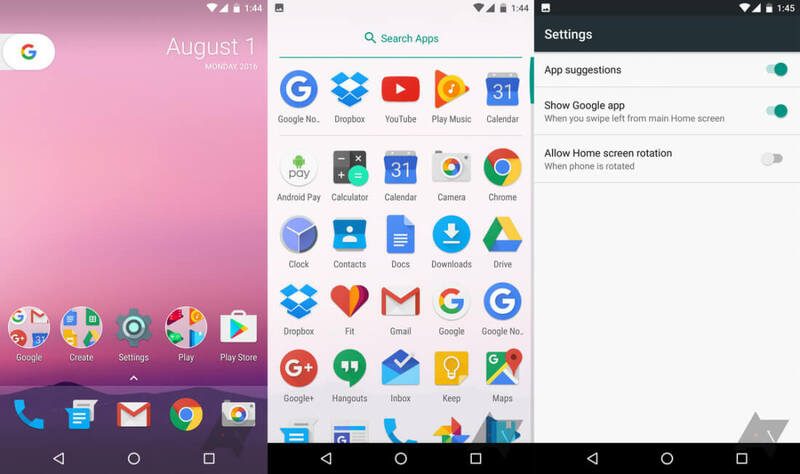 Google is working on a brand new and completely redesigned Android launcher that's set to debut on this year's Nexus handsets, if information from Android Police is correct. This new launcher, potentially called the "Nexus Launcher", removes the app drawer in favor of a panel that slides up from the bottom of the screen. The lack of an icon for the drawer means more apps can fit in the docked section of the launcher, which is now styled to look like frosted glass. The other notable change is the switch from a persistent search bar, to a fixed widget that shows the date alongside a "G" tab. In the preview version shown to Android Police, tapping the G opens search functionality, but sliding the tab does nothing. It's believed that this G tab will feature different functionality in the final version, perhaps utilizing Google Assistant. Aside from visual changes, there's not a lot else that's known about this new launcher's functionality, so we'll have to wait until it debuts on new Nexus handsets later this year to learn more. For those who already have a Nexus device (or any Android phone for that matter), it's almost certain that this launcher will find its way to the Play Store, just like the existing Now Launcher. Check out Android Police's article for a look at some of the visual and animation changes in the rumored new Nexus Launcher.